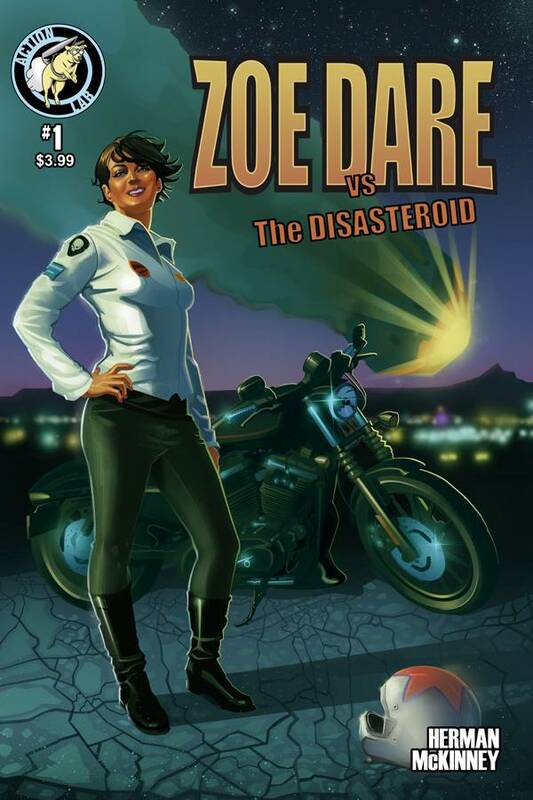 The Fellowship was fortunate enough to obtain a copy of ZOE DARE VERSUS THE DISASTEROID #1 from Action Lab Comics. Brockton McKinney writes, and Andrew Herman draws and colors. Zoe Dare is a daredevil, like her father before her. Her sister Danni is her planner, business partner and best friend. After her latest stunt, they’re approached by the government for a super-secret mission to save the world. There’s an asteroid on a collision course with Earth, and they have two days to send a crew to change its course. But Zoe is in for a laundry list of surprises on this little trip. Zoe is confident, but not too much so. She learned a lot from her dad, and Danni is always there to help her through. There’s a ton of story going on here, too, and there are enough hints (some not so subtle) that it’s going to get really interesting before long. The art is really nice, and the coloring will absolutely blow you away. There’s some serious excitement in store for this series, but you’ll get no spoilers from me about it. Go pick it up and see the awesome for yourself. 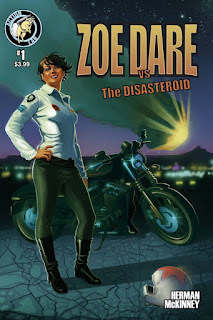 ZOE DARE VERSUS THE DISASTEROID #1 is available now at your FLCS or at actionlabcomics.com.